The theory of the firm has been fertile ground for economists. 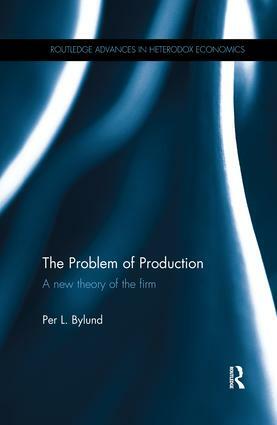 Bylund proposes a new theory, rooted in Austrian economics, which examines the firm as a part of the market, and not as a free-standing entity. In this integrated view, a theory is offered which incorporates entrepreneurship, production, market process and economic development. "The author succeeds in spotlighting the economic function provided by the firm—in place of the traditional view of starting with the conception of a firm —by first looking at the market and its limitations to production. Consequentially, this theory development adds an interesting twist to the attempts to understand the existence of firms." Per L. Bylund is Records-Johnston Professor of Free Enterprise and Assistant Professor of Entrepreneurship, School of Entrepreneurship, Oklahoma State University, USA.